Approximate Dimensions: 15.75in Diameter x 24in Height (w/out airlock in place). The maximum temperature that these plastic fermenters can handle is 140F. Approx. 17in Diameter including handles. To keep from splitting up 10 gal batches. I have one already and love it. Want to expand to 10-12 gallon beer batches. Great for the home brewer. Just the right size for our batches. Upscaled to 10 gallon batches. Have 2 8 gallon Speidels and love them. Love my smaller version, very convenient and durable. To brew 10 gallon batches without splitting into two fermenters. New Secondary fermenters and Storage for larger batches of wine. Do the lines/creases on the fermenter indicate volume at all? BEST ANSWER: No. I took a marker and drew lines on the fermenter while manually filling it with a measuring bucket. The three major lines happen to fall at 5.5 gallons, 11.5 gallons and 16 gallons by my measurements. No, mine came without graduations. No matter, get a permanent marker and an accurate 1 gallon pitcher and do them yourself in about 20 minutes. I believe the lines are 20 liters each. I marked mine in 5 gallon increments. They do not, I used a sharpie to mark gallons up to 10 and it works great. Nope. I used a paint marker on mine. Will this fit with the airlock in a kegerator? BEST ANSWER: Can't answer the question. I don't know the dimensions of a kegerator (don't have one). I can tell you the whole thing barely fits inside a normal size refrigerator. Do not believe so, at least not in a standard size one. BEST ANSWER: The thing I discovered about the gasket is it is designed to fit inside the lid, not on the tank. Inside the lid there is a recess on the outer edge that holds the gasket. To help hold the gasket in place while working with the lid, I coat the gasket with CIP-Film. When you install the lid on the tank, push down on the lid firmly around the perimeter and you should feel it slip into place and hear a slight "pop". When I clean and sanitize this fermenter, it is placed upside down without leaking. I have not had any problems achieving a seal. Hope this helps. There are two areas inside the lid where the ring will fit. The rubber ring goes into the most outside area. It fits well in there. I installed the ring into the inner ring at first. It was too big and the lid would not close because the seal could not be made. Not sure if that’s the problem you are having but after I figured out the correct location, mine works great. I own several of these 60L The gasket can slip off if you are not careful. I press the gasket in and slowly turn the lid over and press the lid on the tank. Make sure the gasket is in the right slot (gasket slot). I think these are wonderful tanks! Make sure you are putting the gasket in the outer most grove on the lid, it looks like it should go on the inner grove at first glance, but this is wrong, It goes in the outer groove. Every time I go to put it on I have to look twice. Can you use a vacuum pump to move wine into these vessels? BEST ANSWER: Yes that can be done through the top port in lid by removing airlock or through the turn valve in bottom. Yes you can use a vacuum pump as well as co2 pressure to push the liquid out. what sized tubing fits the speidel spigot? BEST ANSWER: 1/2" ID silicone tubing fits perfect. Great fermenter ! Easy to move around and has a big open to for cleaning . Seals nicely with no leaks. Spiedel tanks are well made and budget concious. I've used the next size up quite extensively bit needed a smaller unit this time. Everyone in my family says it's so cute. You can almost pick this unit up when full. Why did I wait so long. So much better than fermenting in 5 gallon buckets with difficult lids to open. Very well made and just what I needed. Great design however the gaskets that come with these do not fit at all! I have both the 30 gallon and 15 galllon fermenters and I cannot get either of them to seal properly. They work well for primary fermentation where a tight seal is not necessary however I would not recommend trying secondary or storage with these. I like the size and the construction with handles. Excellent. Had a great 1st wine ferment. I hit up NorCal brewing for some of their custom dip tube/ thermowell NPTs so I could run ball valves. Spectacular. Couple of wines. Got the larger instead of two 30s so for headroom for beer/fruit in must. Works good so far just racked a red and an white into these. I look forward to a long service life. Works great. Rubber ring falls out a little too easily but otherwise, it is well designed. Works great for a 10 gallon batch, cleans up easily and the handles make it easy to move around. have never been able to seal the lid. gasket is in correct groove and tried new gasket. surprised i am only one with this problem but this fermenter is absolutely useless to me...love all six of my other speidel fermenters but this one is horrible. Not a bad thing to say about it. Well made and easy to use. Can easily carry by myself and that’s up two sets of stairs. So convenient to be able to make big batches. Right now I'm using this to finish up 60L of Apple Wine. We will see in 6 months how things turn out. I rated it 4 stars because it isn't stainless steel. After I clean and get ready to brew another batch, I should be able to tell if there is any residual flavors left in the plastic. I hope not. It is a 5 star fermenter if it holds no residual as the price is spectacular. Bought this to add a 2nd fermenter to my operation at home. Have a saison in there now and it worked like a charm. 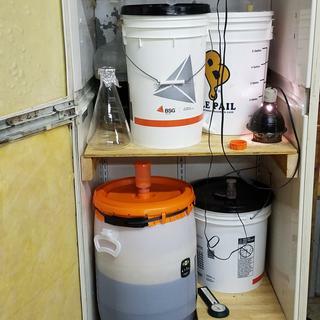 I have a 10gal brew setup so I wanted the flexibility when I decide to make a 10gal batch and didn't want to spend $700 for a spike unitank. Very nice product! My favorite small size fermenter. Excellent fermenter for small size brews. Easy to clean and durable materials. All accessories and connections fit well and cleanable also. Excellent buy! Better with an offer or coupon. Outstanding value and excellent fermenter. All of the craft breweries I frequent use these to brew test batches. Great cheap fermenter...only issue is I cannot get the plastic totally clean. Even with a long PBW soaking, I can still smell some of the hops. Only way to beat this is with stainless steel. 60 litre is just the right size for my 10 gallon batches. I like to rack with my cane and the indentations on the bottom keep the cane off the bottom. Overall I like it a lot. It's super light and easy to clean. Only flaw is the lid and strap to seal it. It requires a lot of strength and patience to fit the lid on it and then to pull the latch to seal it tightly. Got my first batch in this fermenter today and it seems to be a good product. I thought it was a little pricey for a plastic tub with a drain valve and plastic top but I think it will do the job. The only thing I think it needs and would make it as good as my smaller plastic conical is a thermometer well. I use a plastic foil heater to keep my IPAs at 68 degrees in my garage which has an ambient temp between 50 and 65 most of the year. I just tape the foil to the fermenter with metal foil tape..But without a thermowell built into the fermenter I have to tape my contoller temp probe to the outside of the fermenter which isn't really the same as the wort temp inside. This is an ideal product; it's sturdy and holds its' shape regardless of how full it is, the handles are strong, the lid seals really well, it has a spigot for a drain if you want it (otherwise it has a nice cap), and it's easy to clean. I'm not sure it could be better. I just wish they also had a smaller version that still had a large (full-size) lid. I have used this for two years, and it is simply a wonderful fermenter. Setting up to do a Lager which takes some time in the frementer about 6 to 8 weeks and plan for 10 to 15 gal to make it worth while! Love the size! Great product. Very solid construction. Was worried about the plastic handles but they proved equally solid. Lid clamps on securely and large open top makes is easy to clean. Only issue I had that prevented 5 stars was there is a thick rubber seal that goes into a channel on the lid. My seal falls out fairly easy making it tough to put the lid on because when you flip the lid, half the seal rolls out onto the tank. So far, I've used my fermenter once to make 5 gallons of pigeon plum wine. Handles are strong. Easy to clean. The lid/strap design is problematic, but there's a youtuber who shows how to fix that with zip ties I believe. The MoreFlavor folks did a good job shipping, btw. Is this correct MoreFlavor folks? Anyway, this is a very good barrel that is all kinds of useful. Correct, that product will allow you to attach something that has 1/2 in. MPT on the inside of the fermenter. Just be careful not to clog the screen/product you attach on the inside. If you have to many large particles in the fermenter it can clog the screen/product easily. Cheers! I purchased the 60L version and LOVE the fact that all parts are included. These tanks are BEASTS! ID did the mod on the lid to hold the strap in place with zip ties which was very simple. All in all this has been a very good [urchase for 10 gallon batches. I will be buying more. 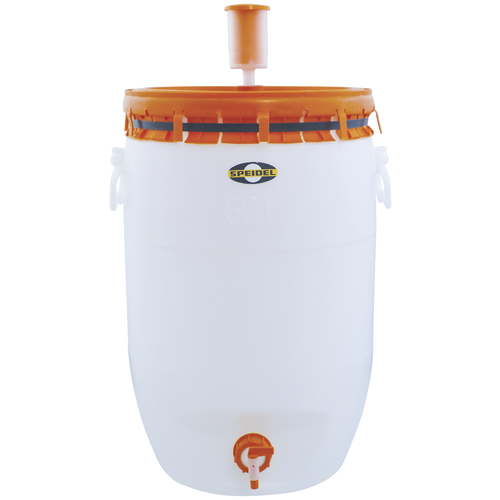 I wanted to love this fermenter, I have the 7.9 gallon version and I couldn't imagine a better plastic fermenter. However this size has some serious problems with sealing. I have to spend 10-20 minutes each time I open it trying to get the lid back on. I've tried putting the gasket in the upside-down lid, it barely fits (too big), and it just falls out when I turn it over. I don't know if I received a stretched out gasket or what the problem is, but I will not recommend this to a friend. +2-stars for quality of the fermenter body and lid, -3-stars for the gasket and seal. Lid design is rather terrible , very difficult to get an air tight seal. I have been ordering the square ones instead as the lid works much better. Get yourself a square one and save yourself from lots of headaches. This thing is great works so well I need more. It cleans so easy with just a light swipe of a cleaning cloth. This thing totally rocks. Easy to set up, easy to clean. You have to be careful when putting on the lid in order to line the seal up properly, but that's not a design flaw, just a "you have to watch what you're doing" thing. I highly recommend for any hombrewer moving into 10 gallon batches to get the 60L version. Lots of headspace for the occasional overactive fermentation. With a blow off hose, you could do a 15 gallon batch in this I think. I added graduations on the outside with a permanent marker after I took the attached photo. Translucent nature makes it easy to see krausen level. Just what my wort needed!! I strongly recommend using this fermenter if you are not ready to invest in stainless conical. There is plenty of head room for frothy fermentation with a 10 gallon batch. No blow off tube necessary and the entire assembly can be broken down for easy cleaning. The included spigot is excellent for transfer beer to keg or bottling bucket without the sometimes troublesome racking cane. It's also very handy to take samples during fermentation to measure SG and temperature. I slightly modified a dorm room fridge and the 60L fits perfectly for an inexpensive fermenting chamber. The only fault I've found and easily overcome is the lack of any volume markings. I have recorded volume based on inches of liquid to resolve. Some have complained of the securing strap for the large lid, but it's really not difficult and is only applied once after filling with wort. The 60L Speidel Plastic Fermenter is amazing. 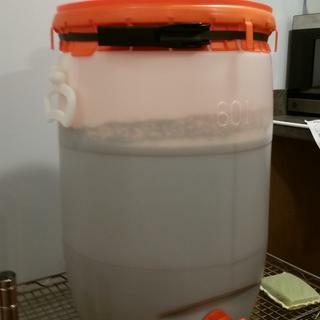 I like to brew 10 gallon batches and have tried using multiple carboys and even converted a 15.5 gallon keg. The Speidel fermenter blows the others away. So much easier to clean than the glass carboys and so much easier to handle than the keg. One modification I did make was adding zip ties around the strap to prevent it from falling off while handling the lid- you can find videos on youtube. Highly recommended. Great fermenter, but tough to seal. I love everything about this fermenter except the top seal. The design is "funky" but should work fine. But the gasket almost seems too big for the lid. You need to fit the gasket in the lid upside down and carefully place the fermenter on the gasket and lid. Then test the seal with some sanitizer. It took me a few times before I got it to seal. But once I did, the fermenter works great. I love everything else about it. Great for large batches, the only complaint I have is it leaks sometimes around the upper Edge. Great secondary fermenter or storage tank. I like this 15 gallon fermenter. It won't let air through, won't break like a glass carboy with a similar footprint, holds more volume, and is easily cleaned. Replacement parts are easy to obtain. Headspace is a non-issue. I use a blanket of CO2 over the wine surface while the peach wine sat for 5 months. I own multiple Speidel tanks in different sizes. Bought two and they are full of Cab. I was worried about air tightness, but that hasn't been a problem so far. Won't give it a five until we see how the wine is at bottling. This is my third year using these for cider. This year they froze very hard. Ice forced cider out the airlock in one fermenter, and out the lid's seal in another. But there was no damage to the fermenters! By the way, you can check the lid's seal by pressing lightly on the top of the lid. The orange part of the airlock should pop up, and it should stay up as you maintain the pressure (don't press so hard that you burp the airlock). If the part falls, then you don't have a good seal. For me, the most common cause of a bad seal is that I routed the black strap over a tab on the lid that it should have gone under. I love this fermenter. No more splitting my 10 gallon batches, everything goes in here and I pitch my starter. Plenty of head space, no need for a blow off tube. I love how deep the bottom dip before the pour spout is, it catches all of my trub and I get clear beer transferred for secondary. Almost as good as conical for a lot less. So easy to clean with a huge open top. Handles are a great feature making carrying it around so much easier. Don't let the price throw you off, by the time you get a carboy/better bottle/big mouth bubbler etc., carrier, stopper/cap and airlock you are just shy of this bad boy. Had to rework my shelves to fit it, but so worth it. I purchased 2 of these after hearing my friend rave about them. Since I usually brew in 10G batches, I really liked the idea of a plastic fermenter after experiencing several shattered glass carboys over the years. * Plenty of space for a 10.5-11G fermentation. stays in place and seals tight. *HEAVY when full with 11G of wort. Dang, I am getting old! would leave about a gallon behind it seems. Anyway, I am very happy with these and am thinking about purchasing the 7.5G for the occasional 5G test brew and get rid of all my glass. You really cant get a better fermenter with this capacity for under $100. I own 2 of the 60L fermenters and regularly use them to ferment about 12-13 gallons of finished beer each. 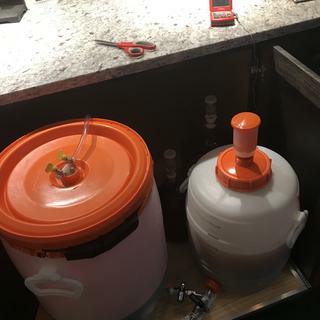 They are easy to move around when empty and if i max out my system and fill both fermenters, i can yield 25 gallons of finished beer between the two. I recommend these to everyone. I would have bought the 120L version, but I couldn't find a fridge that would fit it so i could control my fermentation temps.